As we gear up for Saturday’s opening night of Falstaff, I’ll be introducing on this blog some of Shakespeare’s beloved characters as re-imagined by Verdi and Boito. Let’s start with Falstaff’s two drinking buddies, cronies, and untrustworthy followers, Bardolph and Pistol. Puntuta lesina! Vampa di resina! 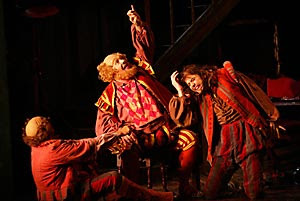 (FALSTAFF: Saltpeter, tar, sulfur! I recognize Bardolph! Vermillion nose, wattled nose! Pointy awl, flame of resin! Salamander! Ball of wildfire! Old battle-ax! Tailor’s yard! Roasting-spit from hell! Dried herring! Vampire! Basilisk! Rascal! Monstrous thief! I’ve had my say, and if I’m lying, may my great big belt snap! !